One of our favorite traveling moms is at again. With her parents and daughter in tow, this time, Jade from Vagabond3 is exploring Sevierville, Tennessee. Home to country starlet Dolly Parton, Sevierville is nestled at the base of Great Smoky Mountains National Park. From its mountain peaks to its unique attractions, it’s packed full of activities for any age. We caught up with Jade to hear more about their springtime adventure and why she says this destination is truly a destination everyone in the family can get behind. Hey Jade! Thanks for sitting down with us again. This time we’re talking about family travel destinations. What do you think makes for a great family travel destination for everyone? Ever since my daughter was born, I’ve tried to bring her along for the ride. A lot of non-traveling friends had mentioned that my life as I knew it was about to stop and I was very nervous that if I didn’t just bring her with me from a very young age that they may end up being right. So since about 6 weeks old, we have brought her along and have found our sweet spot with planning activities and having adult fun and kid fun. I think if you can, bringing the grandparents along on trips allows them to have quality time with their grandchild and you and your partner alone time or adventure time. I like to plan a mix of activities we can all do, like hiking or swimming, and then some more adventurous or more adult only restaurants, especially when we’re traveling with the grandparents. 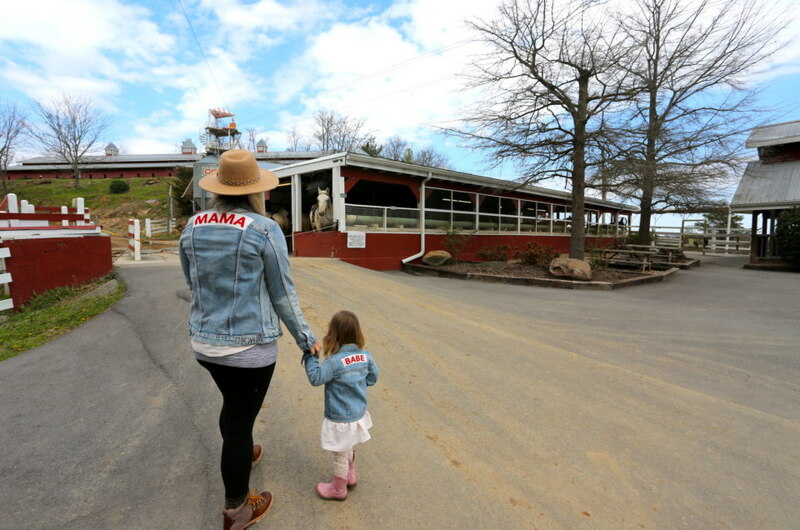 You recently took a family trip to Sevierville, Tennessee. You’ve visited it before — what made this trip different this go around? This time we had Kid Augustine with us, and my parents joined too. Instead of staying in a hotel, we rented a large cabin, which gave us all a lot of room to spread out and a nice homebase for our entire trip. We loved our Smoky Mountains cabin so much that we easily could have spent the whole weekend at the cabin and been totally content. But Kid Augustine needs adventure and to run around so we also did a bunch of kid centric activities that we probably wouldn’t have done if we didn’t have Kid Augustine and we were surprised how much fun we all had- the adults the most! My parents haven’t been horseback riding in years so that was really fun to see them having fun like kids again. My mom was also loving the trampolines at Sevier Air. 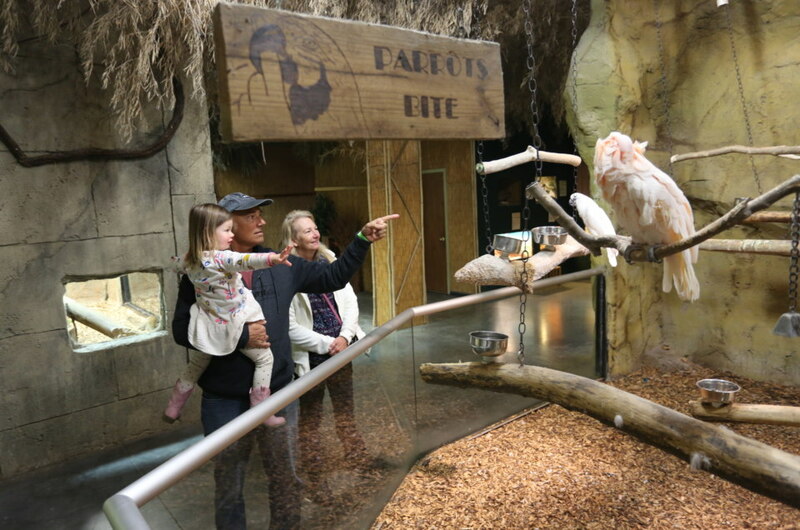 I loved seeing all the different animals at the Rainforest Adventures and we all loved the national park. What’s springtime in the Smokies like? The weather can be a bit unpredictable. We saw snow, rain, wind and lots of sunshine. When packing your bags, just make sure to bring layers and plan your activities with some rainy day options. Luckily, Sevierville has a bunch of really fun activities indoor –including the indoor waterpark at Wilderness at the Smokies, Sevier Air, Rainforest Adventures and lots of shopping options. You spent a lot of time exploring the national park. What are some must-see areas for visiting families? 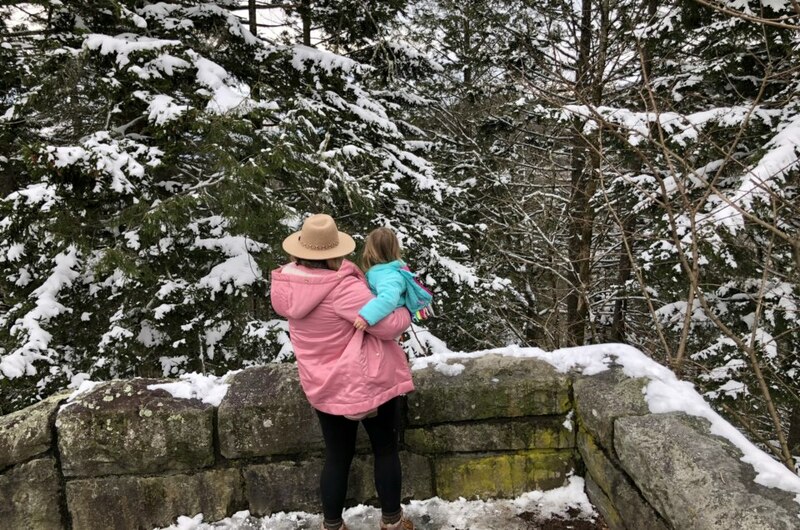 Great Smoky Mountains National Park has so many hiking options, plenty of which are easy with kids of all ages. If you love waterfalls, I’d suggest a hike to Laurel Falls. If you don’t have that much time, the drive to the Visitors Center to Newfound Gap has plenty of pull outs and photo ops. Kid Augustine woke up to an unexpected surprise in the Smokies! Tell us about your springtime encounter with snow. We usually only see snow a few times a year and, while I knew it was a possibility during our trip, I didn’t know if it would actually happen. We were all so excited to drive up the mountain and see so much snow- enough to build a proper snowman. My dad taught Augustine how to throw a snowball and it was as if it were Christmas morning – she was so excited. Watching my parents play with Augustine in the snow was a memory that I’ll cherish forever. What sort of activities did you do outside the park – in downtown Sevierville? We loved snapping a photo with the Dolly Parton statue and grabbing donuts at Courthouse Donuts early one morning. The mini-golf and outlet shopping are located right across from each other- so it was nice to leave Augustine with the boys to play mini golf and my mom and I could go outlet shopping and pick up a few new things for Augustine for surprises. We also loved the Applewood Farmhouse – from wine tasting to walking around the vineyards to dining on some of the best fried chicken I’ve ever tasted, it was easily three to four hours of fun for our family. Your photos were great. What would you consider the most Instagrammable spots in Sevierville? The Mountains provide a gorgeous backdrop all day and from almost any view point. Our cabin in Oak Haven had amazing views in every direction. I’d suggest bringing a picnic lunch (maybe some of the fried chicken from Applewood Farmhouse) and a big blanket so you can watch the fog and mist rise from the mountains (they aren’t called the Smokies for nothing!). If you want to see animals, head into the national park and do the Cades Cove Loop around daybreak or sunset for the best opportunities. If you shoot more buildings for your Instagram, The Diner is super photogenic and tasty too. All of those activities must have made you hungry! What are your top three dining recommendations for first-time visitors to Sevierville? Applewood Farmhouse is a must. Order the fried chicken and the apple fritters. The donuts at Courthouse Donuts are unreal- you can make any combination of flavors you fancy. What tips do you have for families hoping to recreate your visit to Sevierville? I’ve created a guide that you could easily follow and my biggest tip is just to relax, soak up all the amazing outdoor energy, and be prepared to have a lot of fun. I would consider a trip to Sevierville and the Smokies a trip we’d love to recreate year after year. Itching to begin planning your own spring trip to Sevierville, Tennessee this year? Check out the content on our sister site iExplore.com for all the tips, tricks and hacks for your itinerary!